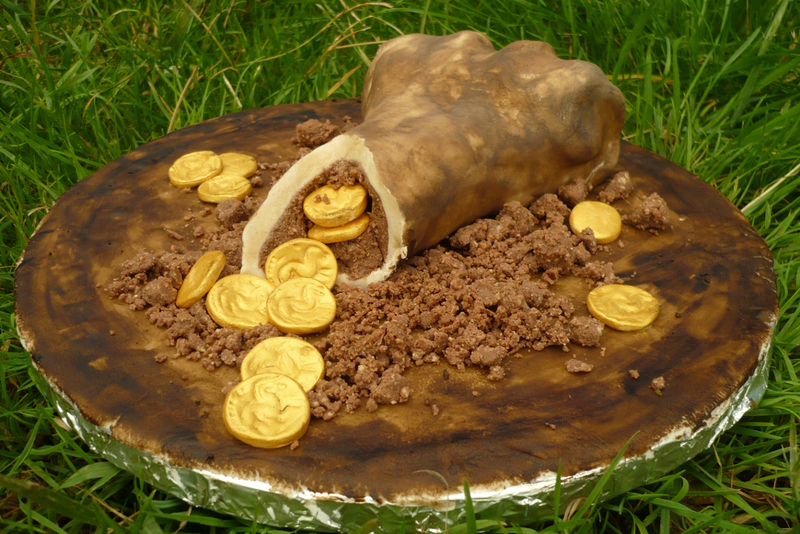 This chocolate cake is a copy of the Sedgeford Hoard, a group of 32 ‘Gallo-Belgic E’ staters that were found stacked inside a cow bone in west Norfolk in 2003. It is one of the most famous finds made by the Sedgeford Historical and Archaeological Research Project (SHARP). The cake was baked by Erica Darch (Norfolk Finds Liaison Officer) to celebrate a successful end to the 2013 season, which has seen more great discoveries including a Middle Saxon oven. Erica said the hardest part was choosing a theme — with an Anglo-Saxon cemetery, Roman villa, crouched burials, and a WWI airfield all forming part of the project, there was almost too much inspiration. This edition of edible archaeology appeared in issue 291 of Current Archaeology.